There's no need to tell you that summer is here. By now, almost everyone is feeling the heat, unless you are visiting from way down under of course. The rains have been coming everyday as they often do this time of year, and the weeds and tall grass could not be happier. Fortunately I got some pots planted up with flowers as well. And they too are very happy for the drink. 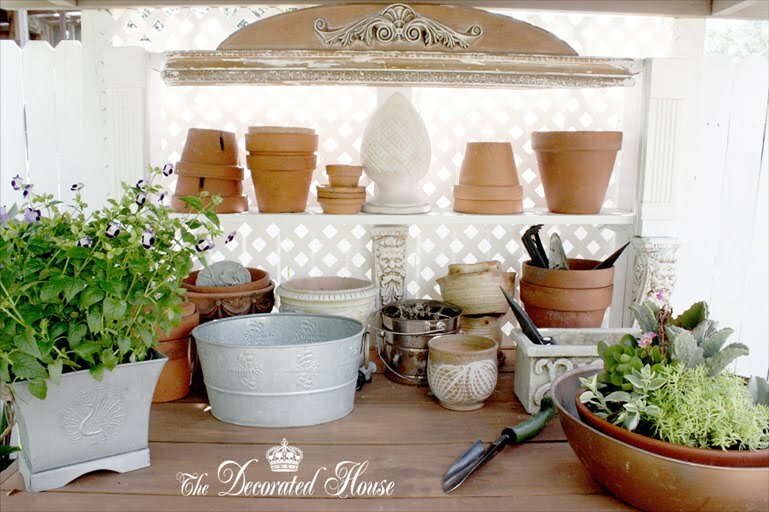 This little potting bench area has always been a favorite of mine and readers. If you haven't previously seen how easy it is to build by using your fence as the backside, or if you would like to visit again, click the link for more pictures and a little more information. It is in need or some cleaning up, maybe a little paint touch up and cleaning the bench top. It has been used and little abused over the years. I think it deserves to be spiffed up a little bit.